The value of antique violins is based on specific factors and the prices for authentic antiques are in the millions. Since these antiques are steadily decreasing in number on the open market, the value will only continue to appreciate. Antique violins have an aura of romantic mystique, however, there are some conflicting opinions on the subject of sound. The debate is centered around whether or not the value of an antique violin is determined by the quality of its sound. Those who argue sound has little to no effect on the price of an antique violin will state that most of the oldest, most highly valued violins in existence are rarely played. 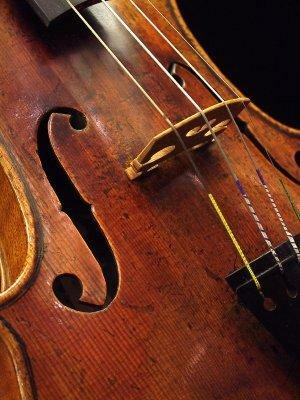 The collectors or museums who own these violins are trying to preserve the violin's condition. The sound of a violin is also greatly affected by the player. The human using the instrument has much more influence on how it sounds than the age or design. The bow will also affect the sound. Many believe that the sound of an antique violin is completely subjective. People perceive sound differently and the perception of sound is often based on emotions. While these are very valid points, it may also be misleading to say that sound has absolutely no effect on the value. Obviously, the most expensive violins are quality made violins. Therefore, the chance that these violins would have superior sound quality over cheaply made violins is pretty high. The biggest factor in the value of an antique violin is supply and demand. A true antique that has the documentation to prove when, where and by whom it was made is a rare find. The supply is low and the demand is high. There is also some speculation that prices are driven up by insider financial collaboration between sellers and the matchmakers or finders, i.e., teachers. These experts allegedly misinform unsuspecting buyers and lure them into paying exorbitant prices for violins that would otherwise have sold for less. In any case, the value of any antique always depends on what a buyer is willing to pay. Perhaps the most famous name in violin making would be that of Antonio Stradivari. Known as Stradivarius violins, they are among the finest and most valuable musical instruments in the world. Antonio Stradivari was Italian, born in 1644 and living until 1737. He would inscribe his violins with Latin slogans. Therefore, the violins became known as Antonius Stradivarius or simply Stradivarius violins. These violins became world-famous because of the quality of their sound. The quality of the wood, the shape of the instrument, the thickness of the wooden plates placed in the belly and back of the instrument and the varnish of the wood are all believed to be important factors that contribute to this powerful, superior sound. The earliest violin makers were northern Italians Gasparo da Salo (1540-1609), Giovanni Maggini (1579-1630), and Andrea Amati (1520-1611). Giuseppe Guarneri was a violin maker from Cremona, Italy and lived from 1698 to 1744. Around 1730, he made two violins from the same piece of wood. One of these violins, called the "Kreisler", was given to the Library of Congress by Fritz Kreisler in 1952. The other violin, known as the "Baron Vitta", was given to the Library of Congress in 2007 by Szymon Goldberg's wife, Miyako Yamane Goldberg, to reside with its twin. With the value of antique violins being such a subjective debate, what about investing in them? Investing in something like rare stringed instruments, requires a very specialized knowledge. Even the annual average value increase for violins is a debatable subject, with estimates ranging from 2% to 15%. The highest price a Stradivarius has ever sold for at a public auction was $3,544,000. It was called the Hammer and was made in 1707. However, this record price only applies to public auctions. Privately, Stradivarius violins have sold for much more. A quality reproduction Stradivarius can be worth between $2000 and $4000. If you have the expertise, the passion and the capitol to start investing in antique violins, they have the potential to be a secure and sound investment. With the population growing and the supply of genuine antique violins diminishing, the prices have nowhere to go except up.